Squash House Quilts: Granny Stripe Blanket Finished! 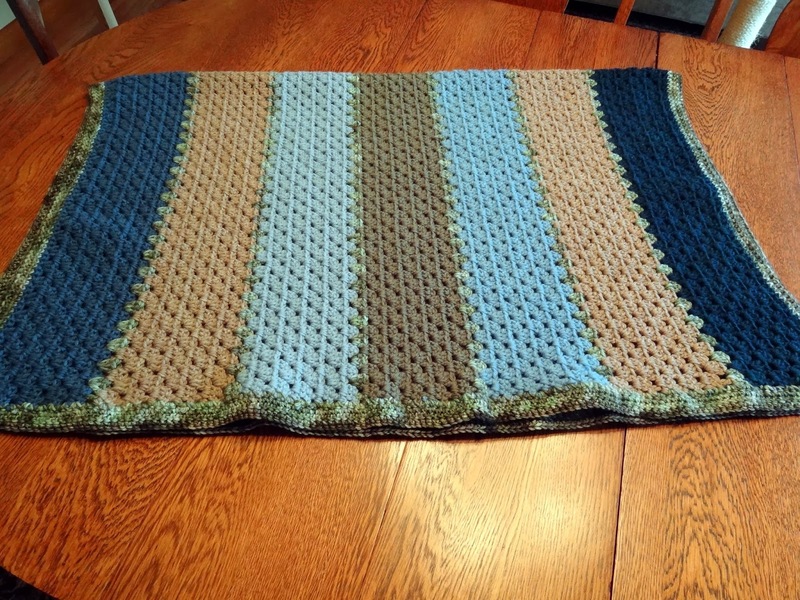 I got on a crocheting streak and finished my Granny Stripe blanket! I actually finished a few weeks ago, but it's been so gray and foggy here that I've had a hard time getting good photos. This photo was taken right after I finished it. Day before yesterday it began to snow just as the Super Bowl started! Yesterday it was still snowing so I thought perhaps the brightness from the snow would help my photo taking! Of course Sasha is a ham and has to be included. I'm very happy with how the yarns I didn't like worked out in the blanket. It's 100% cotton except for the luscious Pashmina worsted wool blend I used between colors and around the edges. It's small - lap size, but just perfect for me. 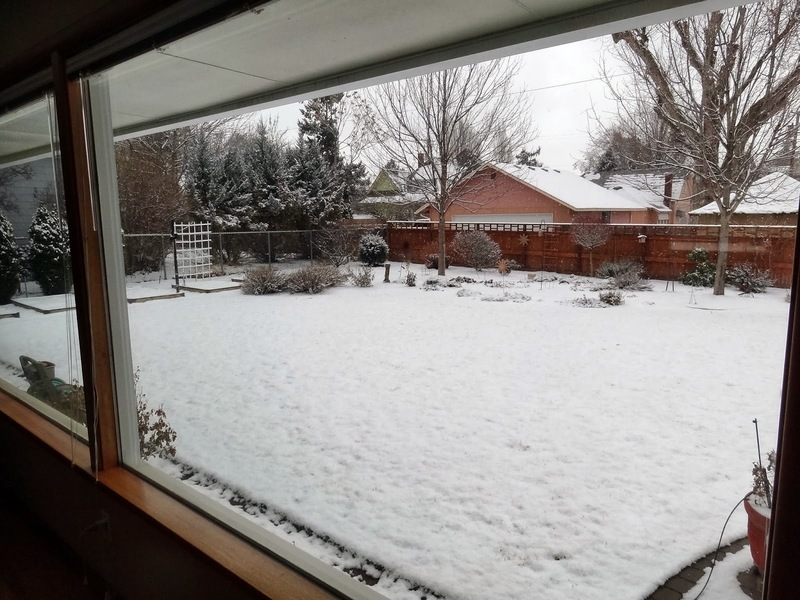 If you click on both these photos you'll see snow lightly falling. I love how pretty and clean the snow looks. We'll take it any day over the fog we've had for weeks now! 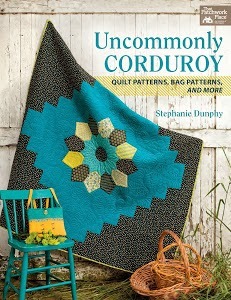 Today is the release of Stephanie over at Loft Creations new book - Uncommonly Corduroy! You'll be amazed what you can sew using corduroy! I know first hand as I helped to test some of the patterns in the book. She's also having a giveaway. Please go visit Stephanie and congratulate her on her book release! Your Granny Stripe is beautiful. I'll bet it is cozy too. The fresh snow looks so pretty. 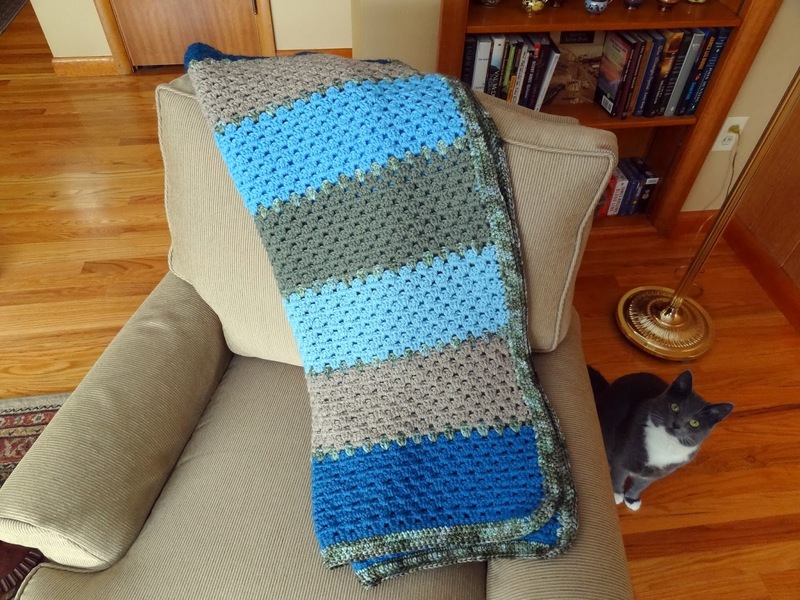 Love the colors of your new lap blanket and glad that Sasha is so helpful! The snow is so pretty (when you can stay inside and look out!! )- they are forecasting 6 - 10" of snow for us for today and tomorrow. I will be watching it from my cozy sewing room! Your granny stripe came out beautifully! I bet the cotton yarns feel wonderful. I love the snow pics...your place look pretty in any season. Love your granny stripe ! Sasha is a ham... What a cutie :-D We are expecting snow here Thursday .I can't wait ! Your blanket is gorgeous, I love the colors. Is there anything you can't do Candace - I swear you are so dog gone talented!! Hugs my friend and enjoy the snow. We don't have any snow, but it's all around us. And it's so cold I am freezing even in the house with the heat on, ugh. Great job on the blanket. We have so much snow here I said I'm no longer going to talk about it! Your blanket looks so comfy. I'm still thinking of crocheting something. There's a yarn shop in this new town, but I haven't visited yet. But plan on it soon. What pretty colors in your granny stripe throw. I could use one now to snuggle under because we had another snow storm blow through here yesterday. What a snuggly lap blanket Candace- perfect for your weather. The colours look really good together. I quite ennvy you your snow. We still have every shade of grey. 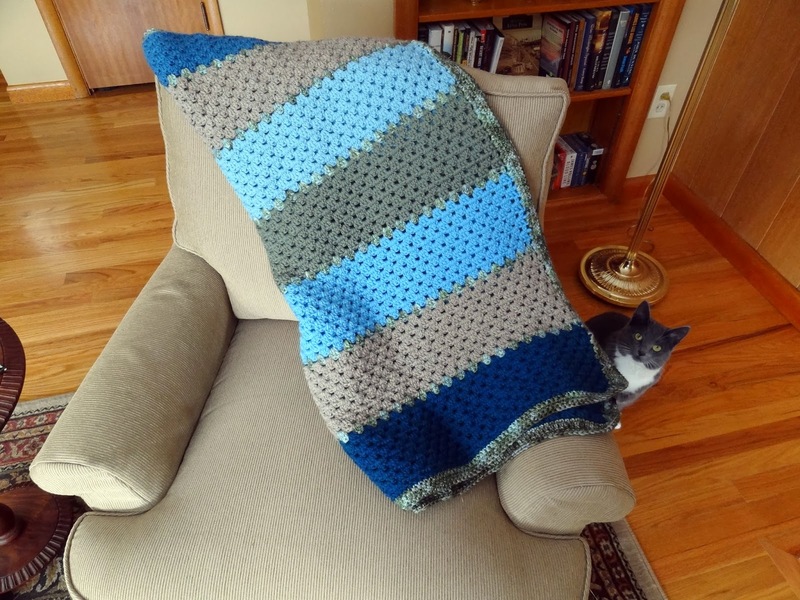 your afghan turned out great. 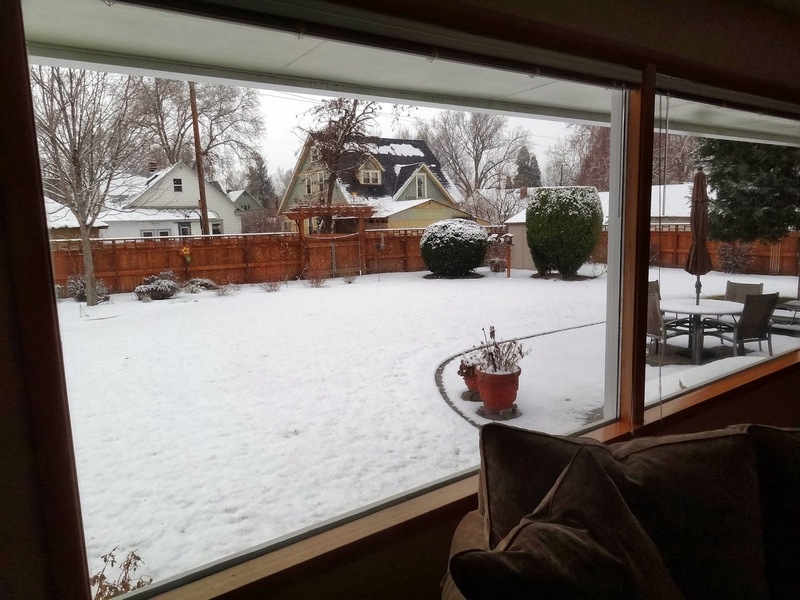 it will be nice and warm while you watch the snow fall. we might get some snow this week. I love those big picture windows you have in your home. I haven't made a bag or quilt using corduroy! That situation will be remedied in the near future. As soon as I buy some fabric. I would like to make the Abby Go to bag. A lovely BIG bag to hold all my bits and pieces.